With a mango and basil coulis. Makes 1 pint jelly mould. Soak back the Carrageen in cold water for 5 min. Mix your cream and coconut milk and then split it into 2 small saucepans. In one, add your seaweed and simmer for 15 to 20 minutes. In the other saucepan add the honey and vanilla pod and heat gently. Strain the jellied Carrageen mixture, pressing and scraping it into the cream /honey pan, stir well. 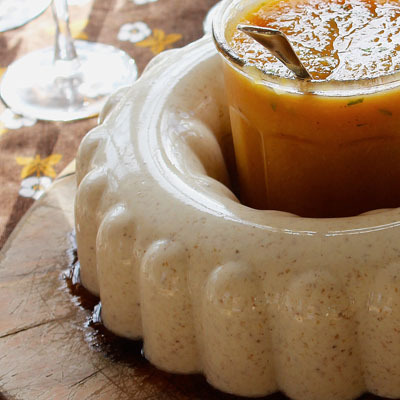 Pour into a jelly mould and let it cool to set. Peel and slice up a mango, add a tsp of runny honey, half a lemon, juice of an orange and whizz with a hand blender. Chop up about 4 large basil leaves and spoon over your coconut Irish moss pudding.